Garage Sale! Our annual fund raiser! One location, goods from dozens of families! Just download the flyer, print it and post it at your local grocery store, synagogue/church, or favorite coffee shop! What a great way to clean house! Donate your gently used clothing, toys, working electronics, furniture, and household items. If it works and is in selling condition, we want it! Tuesday, May 27th between 12 - 3pm. to arrange a drop-off time. Pre-Sale!! 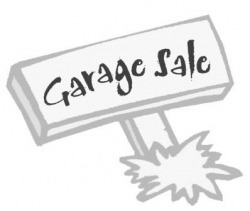 Thursday, May 29th from 4 - 6pm we will meet at Ann's house to tag/organize sale items (Pizza Party!) This is also a "Pre-Sale" for any LLL moms who help out - get first dibs on any of the items and take them home that night! After the sale, no donations will be returned.